‘Mizuya' is a term derived from the radical (氵or 水) and right (谷) part of the character 「浴」. The character 「浴」means to bathe in water. 「氵or 水」by itself reads ‘mizu’ and 「谷」 by itself reads ‘ya’. In Zen, the mizuya is a place monks perform an act of purification at the start of each day before they go out and commence their activities for the day. 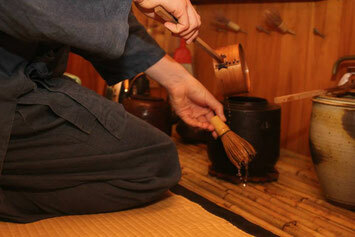 In chanoyu, too, the mizuya is a place to purify yourself and your equipment before you enter the tearoom. There are shelves in a mizuya called ‘mizuyadana’. When there is no provision of a formal mizuya at a tea gathering or practice, a temporary mizuya with shelving is set-up. 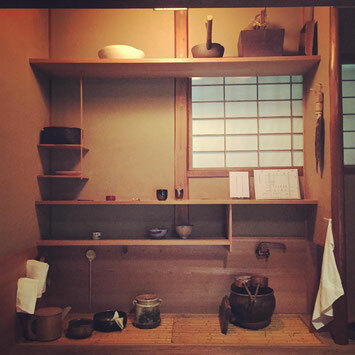 Tea equipage are placed on their specific location on the mizuya shelves. 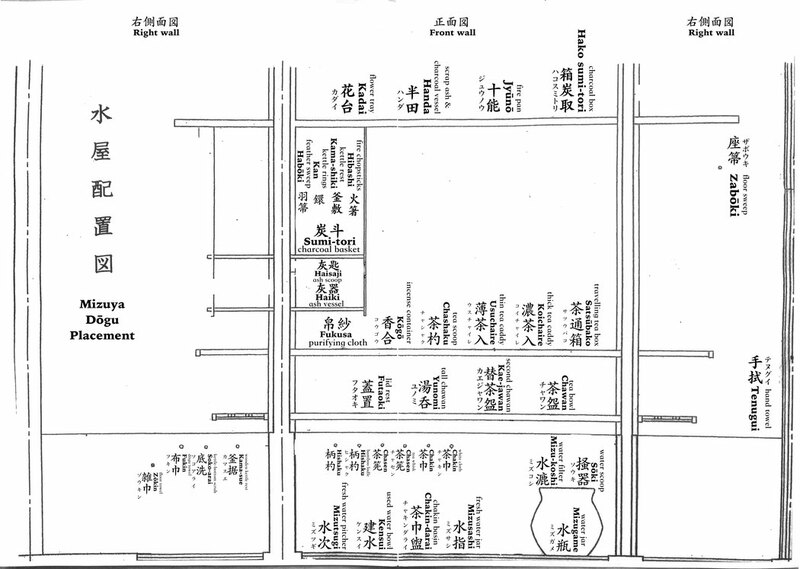 The complete details of where to place each item of tea equipage is called the ‘mizuya kazari’ (see diagram). When equipage is taken out for practice of a tea gathering, all items are placed in the mizuya according to the mizuya kazari. And when you use tea equipage in practice or a tea gathering, you must return them to their specific location in a state as they were prior to use. For example, if you take tea from the tea caddy, you refill the tea caddy with the amount of tea you used. You wash the chawans you used and place them back on the shelf, wash the chakin used, and refill the water in the mizusashi, etc. When using the mizuya for practice or a tea gathering, first you light the charcoal and start boiling the water. While the water is coming to the boil you take out all the other tea equipage you will use. At the finish of practice or a tea gathering, you purify all the tea equipage and return them all to their proper storage place. All tea equipage has an appropriate way of purifying prior to and after use, so please learn this well from your teacher and others.